Let the Games Begin - 6 Bedroom Home with all the Amenities! Property Size 3,220 sq. ft.
Trappers 78 is a gorgeous luxury retreat featuring 6 bedrooms and 5.5 bathrooms, located in the beautiful Trappers Ridge development. The house was purchased by the current owners in 2017, who have made significant improvements to make your stay as fun and relaxing as possible. The house sleeps 16 people comfortably. The layout includes 2 king master suites, 1 queen bedroom with full bath, 2 bunk rooms with two sets of bunk beds in each (4 beds per room in each of the 2 rooms), and 1 room with 2 twin beds. One of the bunk rooms has a full bath, while the other uses the full bath down the hall. The house includes a large great room on the main level which opens into a gourmet kitchen. A new expandable dining table will accommodate your entire party, and there is also a cozy seating area in front of the fireplace and big-screen television. Off of the kitchen is a newly rebuilt deck with a new oversized grill. The deck provides SPECTACULAR views of the mountains and sunset. On the lower-level, a large recreation room with games, seating, and television is the center of activity. The lots on either side of the house, along with the area behind the house have not been developed, so Trappers 78 provides more privacy than most houses in the development. One other note (from the wife of one of the owners): the house is double insulated, so it is exceptionally warm and not drafty! This house has everything your group needs to have an amazing vacation, because the owners have been in your shoes! · 2 60 inch + Samsung TVs in the family room and recreation room. Internet connected, so Netflix, amazon, etc. are right at your fingertips. Each master suite also has its own TV. All TVs also receive Directv. · Free wifi (of course) recently upgraded to the fastest speed available in Eden (50 MPS). That may not sound fast if you are coming from your house with a cable connection, but most houses in Eden run at 3 – 10 MPS, so it makes a HUGE difference. Like painful to get email difference. · Sonos speakers in the family room, recreation room, and downstairs master suite. If you have never used Sonos, you will want to buy one after you leave. · Hot tub directly outside the back door on the back patio. · Oh yeah – pool table, ping pong table, games, puzzles, and movies available in the house. · You can pack a little lighter and use the brand new high capacity washing machine. · Keyless combination locks so you don’t have to carry keys. · Ski and snowboard pegs for nightly ski placement. · Boot benches for easy of taking off or putting on boots. · Printer / scanner available for use if needed (try not to work too much) but very handy for printing boarding passes or directions. · Big pot coffee maker for the morning group, a Keurig for an individual hot brew (or hot chocolate) later on. We hope this house provides a good fit for your group, and we look forward to hosting you! 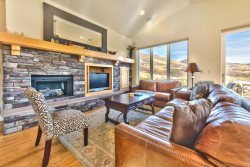 Trappers Ridge is a planned community of single family homes just a 10 minute drive to Powder Mountainand both Snowbasin and Wolf Creek Utah Ski Areas are within a 25 minute drive. The community features a pool & year-round hot tub overlooking Pineview Lake, Clubhouse with fitness center, ping pong and club room for private functions. There`s also a tennis court and basketball practice area, and the neighborhood trail connects to Wolf Creeks network, offering about a 4 mile loop. Complimentary Wi-Fi is also available at Clubhouse. Very nice large well equipped mountain home accomodated our family well for our annual ski trip. Lovely time in Eden. Really enjoyed this property. Utah Lodging did an excellent job! clean,all paper products available. liked it a lot.